Le Monde diplomatique (Oslo), has a global and intellectual focus. The monthly newspaper prints articles from the original French edition in Norwegian, and a lot of other articles initiated from its editorial office in Oslo. Le Monde diplomatique has around 25 different national printed editions and some other internet editions worldwide, which amounts to several million readers. The Nordic edition has, in addition to the translated French articles, a special focus on political thinking and visual art. Usually one visual artist is used to illustrate a part of the newspaper. 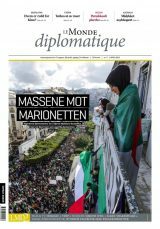 Le Monde diplomatique (Oslo) is mostly distributed in Norway, but also has readers in Denmark and Sweden. It is also a monthly supplement to the daily newspaper Klassekampen [Class struggle]. In total, Le Monde diplomatique has around 50 000 readers. The Nordic edition was started in April 2003, and its chief editor is Remi Nilsen. En tredjedel av avisens innhold redigeres av vår norske redaksjon, mens resten er vårt utvalg fra den franske utgaven. Nettstedet er www.lmd.no.